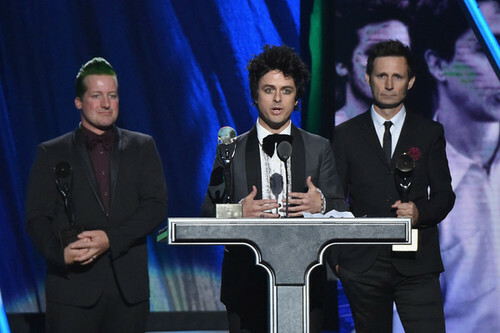 Green Day Speaking @ the 30th Annual Rock And Roll Hall Of Fame Induction Ceremony. April 18, 2015.. Wallpaper and background images in the Green Day club tagged: photo green day billie joe armstrong tre cool mike dirnt 30th annual rock and roll hall of fame induction ceremony on stage induction speech april 2015. This Green Day photo contains business suit. There might also be well dressed person, suit, pants suit, pantsuit, suit, and suit of clothes.